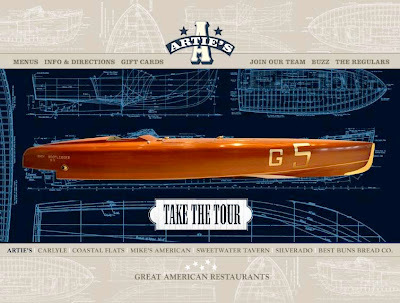 Artie's In VA. Great Antique & Classic Boat Dinning. If you’re in Northern VA, or the Washington DC area. Look up Artie’s in Fairfax VA. www.greatamericanrestaurants.com/arties Artie’s is part of a chain of extremely well run and designed restaurants by the the Great American Restaurants Co. Each restaurant is a different theme. 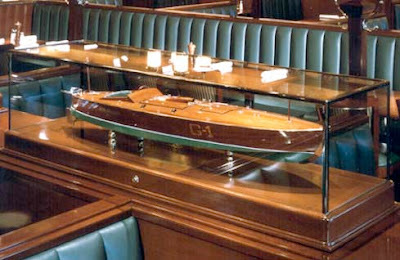 Artie’s is a boathouse full of Antique & Classic boat art, models and murals. It’s tastefully done, not a Vegas side show. To top it all off, the food is very good. Seared tuna, steak, that sort of stuff. It’s priced reasonably for the Washington DC area. If you’re coming in from Toledo, it’s on the high side, but then again if your coming in from Toledo, a cab ride in the area is going to be the same as your mortgage payment. If you plan on going, they don’t take reservations, so call ahead. That’s how you work around the sometimes 1 hr wait. We highly recommend Artie’s. Stillwater Boat Company! They Can Make Your Fantasy Come True. Chris Smith &amp; Logan Wood Meet Up. A Perfect Day On Lake Dora, And Thank God For The Rain!